This is going to be a very personal item. That doesn’t mean it will contain juicy details or revelations of secret information. It just means it might not interest anybody else but myself – hence the ‘Auto psycho….’. In my professional life I pretend to be a guitar player – for the past 35 years or so. I can’t believe that myself. If you care to suffer through my long bio you would notice that I never played in a very successful musical group. I also never played music in a highly profitable band – such as a cover band or a wedding band. I am sure that was partially due to my own conviction that my art was somehow ‘pure’, however stupid that sounds (and some of the music that comes out of such a conviction.) And somehow potential employers must have ‘smelled’ that I wasn’t cut out to emulate somebody like a Carlos Santana or Eric Clapton. In the past years I have often heard from people who come to our concerts that they admire my style. They say I play like nobody else. I don’t know about that but at the same time it’s flattering. I have many influences in my playing and don’t deny that if I hear John Scofield play a cool thing I like I’ll try to figure it out and use it. Obviously my narrow mindedness carries much of the blame that I fail to impress a broader audience – I don’t play for them! Now, all of this sounds like it’s a true disadvantage. After all, it looks like a perfect way to forgo fame and fortune in favor of a self-serving artistic goal. I don’t want to talk about artistic integrity or some such high-flying claim. And I don’t really believe in reincarnation, a soul, telling the future from tea-leaves or something along those lines. But I can see something decidedly ‘supernatural’, out-of-this-world in the recognition that now I am the guitar player I went out to see when I was in my teens. Because back then I was the teen who went out to see a guitar player in concerts. This teen would imagine to be that guitar player. This teen probably didn’t even listen to what the actual guitar player on that gig played but rather what he (the teen) would play were he in his (the guitar player’s) place. And then, over the years, this teen slowly, and unnoticed really, evolved into that guitar player and today looks into the audience and finds that one person who he used to be. To become utterly philosophical you could say that this would have created two poles. You don’t get much of an interchange with one pole. It’s silly, really, but I am still striving to become what that teen saw in that guitar player 35 years ago. Or simply said, I now realize that I am the carrot that was once dangling in front the teenager I used to be. 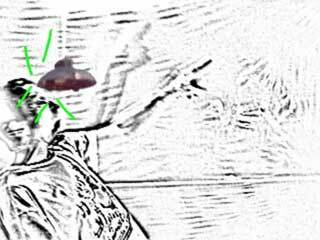 Ok. After building a greenscreen in my basement, enlisting my kids as actors, digging deeper into Final Cut Express, Toon Boom Studio and a few other applications I noticed that I still would need some “authentic” footage to put together a video about UFOs. Luckily there is youtube which is full of obscure (and not so obscure) footage from various sources. That it still took me over six weeks to fabricate this not quite four minute piece of *your pick here* is a testament to my stellar inability in all involved skills. To add insult to injury I don’t know which movies or documentaries most of the youtube footage came from. And since this video is actually a music video featuring the tune “Call the Police” from my new CD Peter’s Money I thought it might be appropriate to send a free CD to the first person to identify a certain clip used in the video. 1) Can you identify the original movie or documentary a certain clip came from? 2) There are four distinct short musical quotes from well known movies or TV series in the song (actually they roughly correspond with the visuals….) – do you know the source of these? If you know one, please, post the time when the clip/sound appears (minutes/seconds) and what movies, TV series, documentary it is from right here in this topic. Please, only one answer per post although post as many as you want. Whoever identifies the material first gets a free CD but should refrain from posting more answers. Just to give everybody a chance.